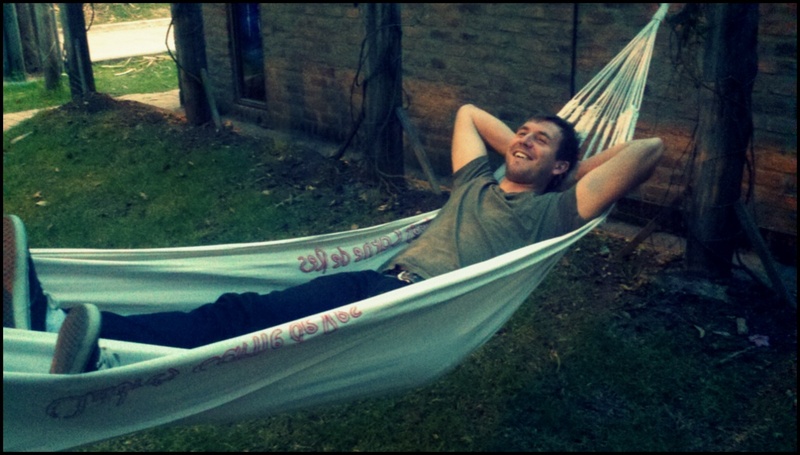 Last month I had the opportunity to travel to Bogotá, Colombia for one of my projects at work. After a week of long 12-13 hour days, we were lucky enough to have a co-worker in the local Bogotá office show us around the city for the weekend. Maria and her beautiful family, including her husband Ricardo and her adorable six-year-old son, Juan Jose, went above and beyond to make us feel welcome. Both Saturday and Sunday, they spent the majority of the day taking us out to great meals and interesting places, and even took us back to their fabulous renovated home where I played Nintendo Wii with Juan Jose. I am so grateful to them for all of the time they took out of their personal lives to make our trip so memorable! In addition, it was really nice to get to know 2 of my co-workers from California, Gina and Mary, so much better. Maria and her family embody the same welcoming culture that I experienced from everyone with whom I came in contact with during my stay in Colombia. They did an amazing job making us feel safe and educating us on the culture and the city’s surroundings. When you hear Colombia mentioned in the media, you may only hear about militants, guerillas, drug trafficking, machine guns, and kidnappings. But like most other things in this world, only the negatives are highlighted in the media. Instead, what I experienced was a very developed, beautifully green sub-tropical city nestled at the foot of the Andes mountains, full of very fashionable, lively, and welcoming locals who are proud of their city and are eager to share it with anyone who is interested. While it really is important to be mindful of your security when traveling to Colombia, if you have an opportunity to visit there with the help of someone who resides there, I strongly recommend it. It really is a beautiful place that deserves to be seen in a very positive light. 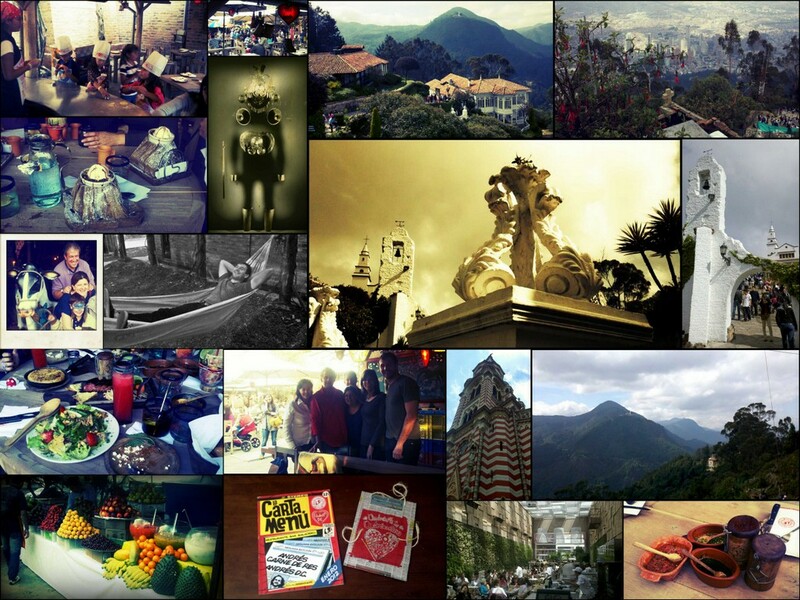 In addition to the photos shown below, my Colombia photo album has some additional photos. 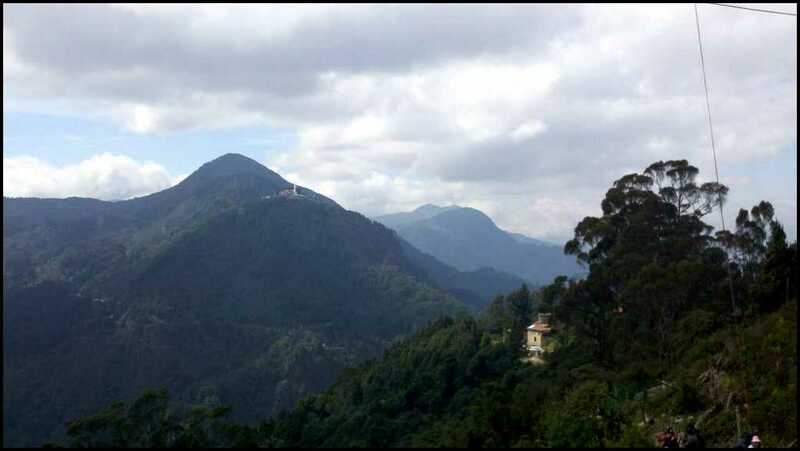 Climbing to over 10,000 feet, Monserrate is a mountain peak that rises suddenly from the Bogotá cityscape to meet the Andes mountain range. We took a large tram operated by giant pulley/cranes to ascend from the city, but you can see people at the lower right of the photo who made the trek on foot. 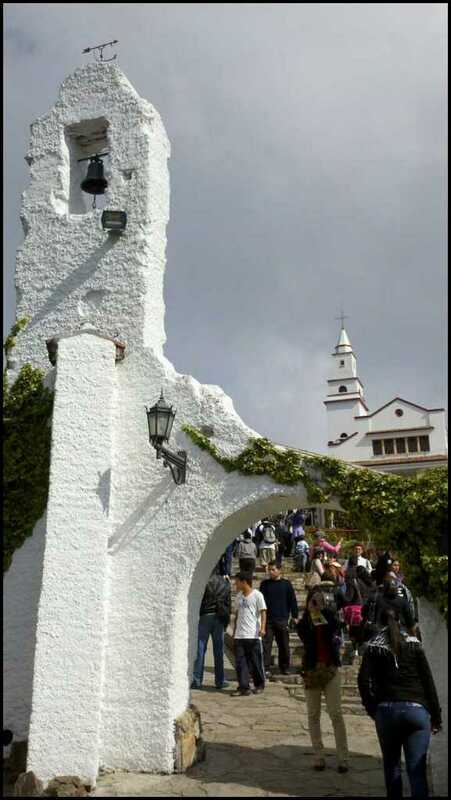 At the top of Monserrate is a Catholic Church, to which many make the 10,000 foot pilgrimage on foot, some even on their knees!! 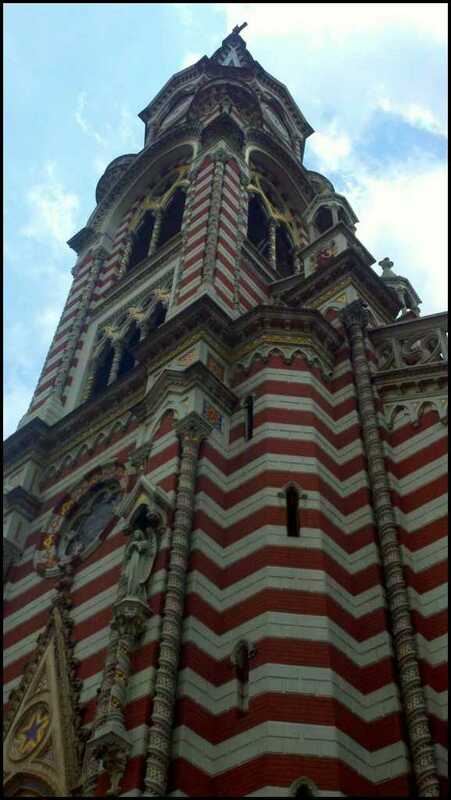 Ricardo told me that this historic building from the city was shipped up the mountain (!!) and re-assembled. I believe now it serves as a restaurant. 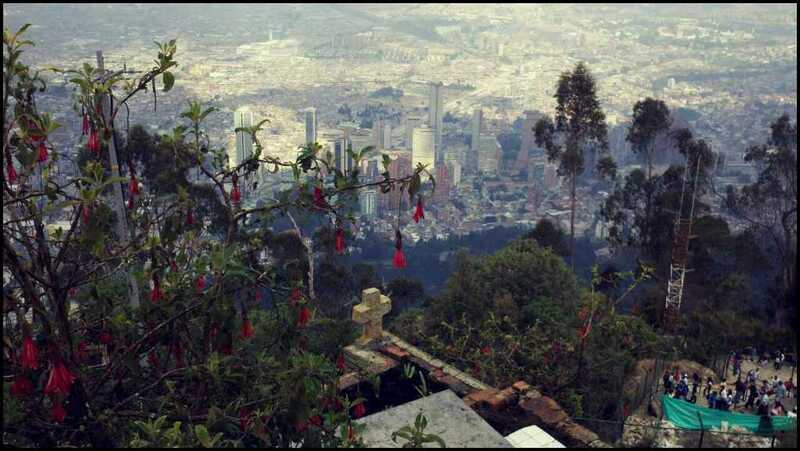 The peak in the distance is Monserrate’s neighbor, Guadalupe Hill, with a giant statue in tribute to Guadalupe. Another look at Guadalupe Hill in the distance. 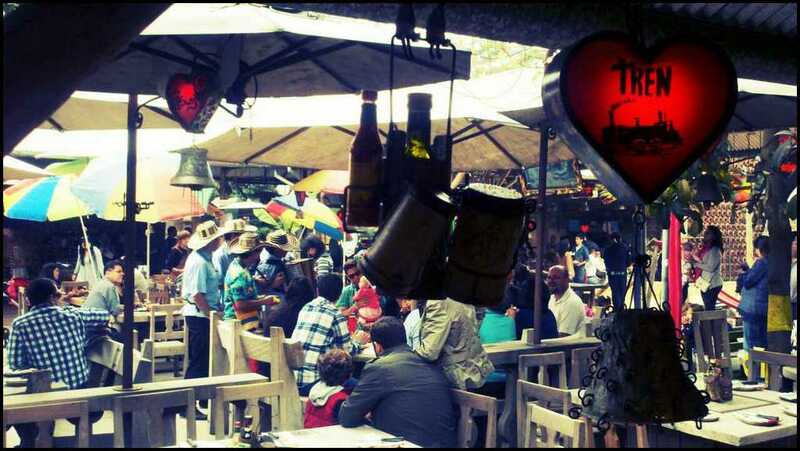 “Andres Carne de Res” is by far the most original restaurant that I’ve ever been to. The original location is built outside Bogota in a smaller city called Chia. Ricardo told me that it started out humbly as a rickety building with 4 tables, and has continued to grow organically to encompass 4 city blocks, and seat over over 3,000 people with 300 servers at any one time!! Even coolor – Andres promotes higher education by insisting that all employees must be actively pursuing a college education or they cannot continue to work there. The buildings have been built over time with very little planning, using only recycled, scrap, and hand-made materials. The structure itself is a labyrinth of metal, wood, and plaster, traveling up, down, and across tables, sometimes with city streets running through the restaurant itself! Everything appears to be hand-made out of these raw scrap materials, including the silverware, tables, even the ovens. Check out their website which is almost just as original as the restaurant! 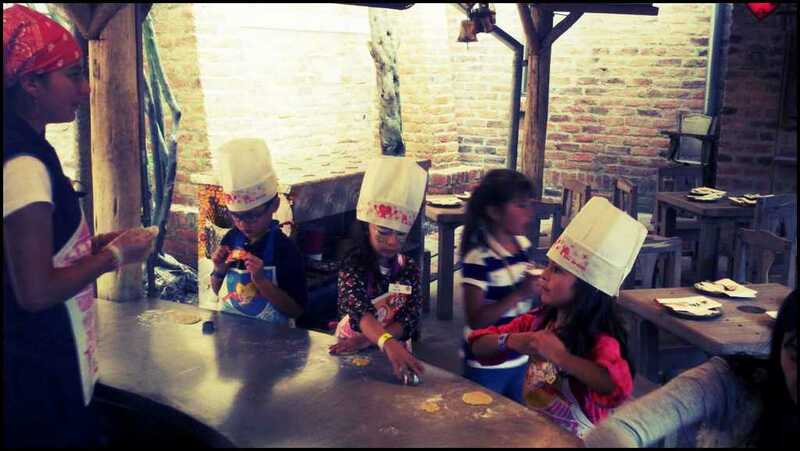 Here’s little Juan Jose baking pizza from scratch in his adorable blue rimmed glasses. Andres’ business model is genius: children are allowed in the restaurant daily until 7pm, then after 7pm it becomes adults only for dinner, and a night club afterwards. During the day, parents can pay a very reasonable ~$10 and their child is 100% entertained the entire time, with face painting, toy making, pizza baking from scratch, rock climbing walls, drawing classes, dance/salsa classes, clowns, magicians, costume shows, and pretty much anything you can think of. Children wear a bracelet that does not allow them to exit the building without an adult with a matching bracelet. It is 100% safe, and the parents are put at ease to enjoy dinner. It’s like a carnival inside, but somehow it is not disruptive or annoying while you’re eating. Genius. 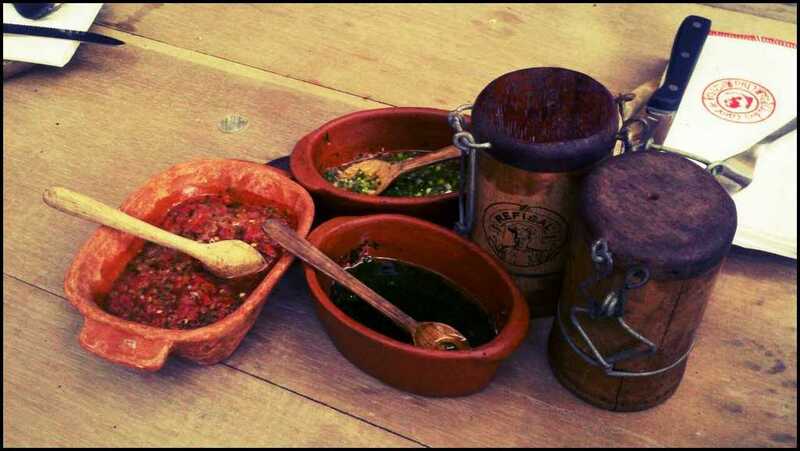 Home made salsas are brought to the table immediately upon sitting down. Love the hand-made salt and pepper shakers. What a spread. Everything was delicious, complete with local cheese, corn, and strawberry lemonade. I can’t speak for the meat (I’m vegetarian), but everyone else at my table loved it. Ice cream volcanoes! No, that isn’t all ice cream or cake. 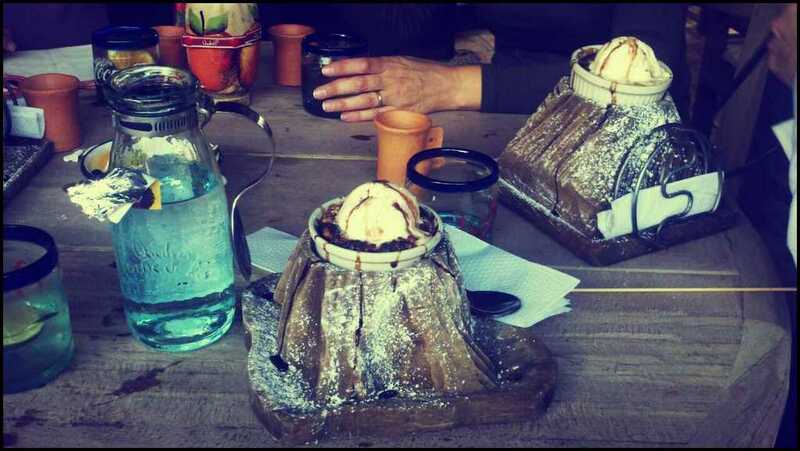 They are hand-made wooden “volcanos” with ice cream on the top. 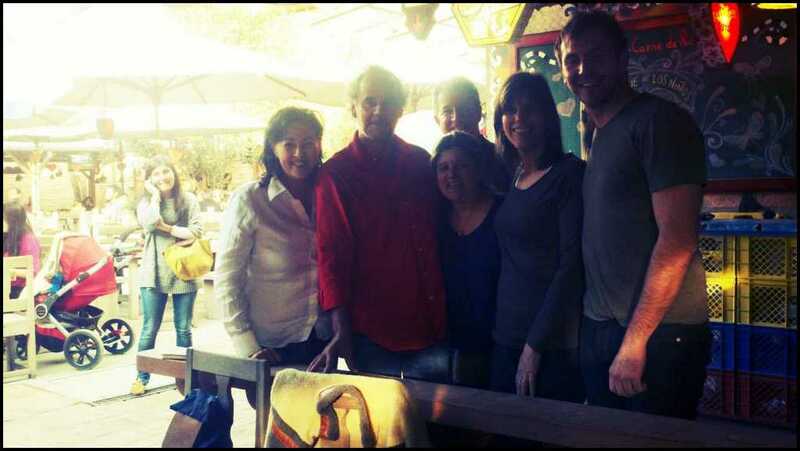 A photo with Andres, the owner (red shirt), who was entertaining a guest near our table that day. Ricardo and Maria are in the middle. Gina on the left, and Mary and myself on the right, traveled from California for work. The menu (left) is gigantic with everything under the sun. We just told Maria and Ricardo to order whatever was good because there were thousands of options. 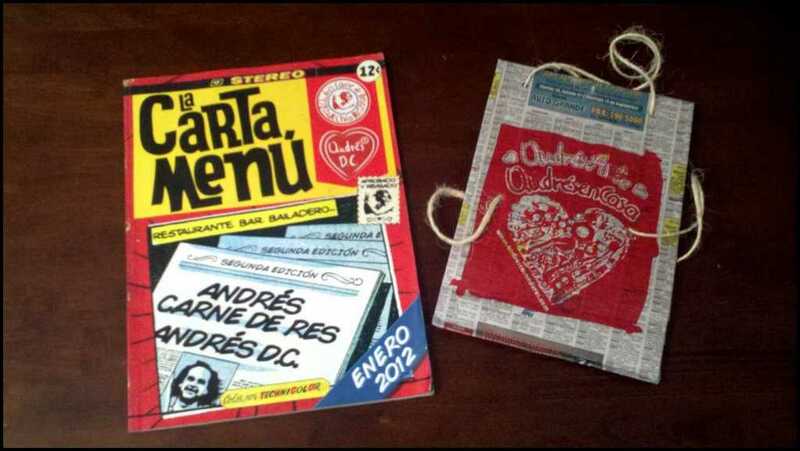 If you buy anything at the gift shop, they hand it to you in a bag that is hand-made out of screen printed newspaper with yarn handles (right). I love how every single detail of this restaurant uses recycled material. 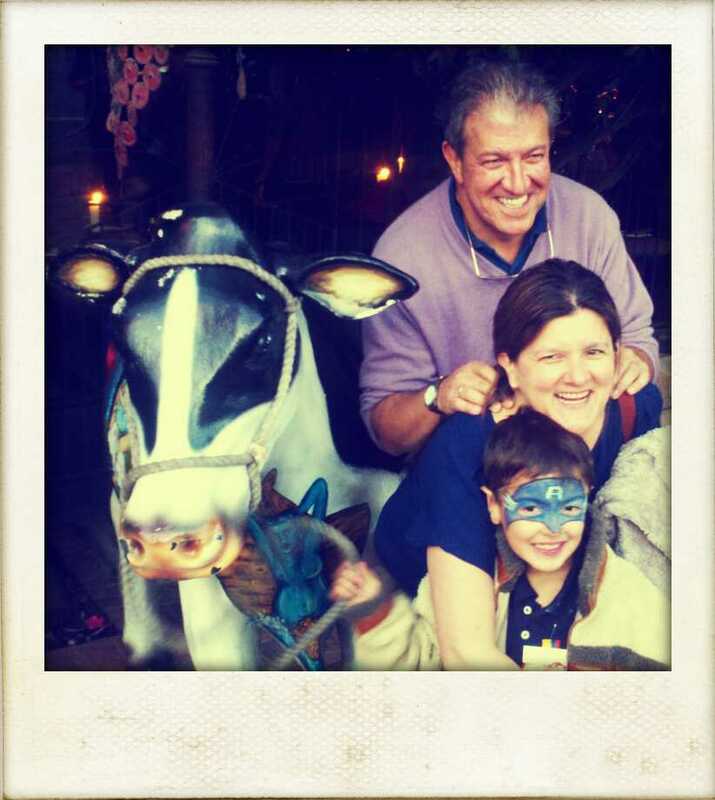 Ricardo, Maria, and their adorable son Juan Jose after an action packed day at Andres restaurant. Juan Jose had a blast! They told me that they bring him here once every 2 months or so, and he’s always so excited. I thought this Catholic Church in downtown Bogota was pretty original. I was surprised to see that these stripes are painted inside too! The Museo Del Oro displays gold artifacts from Colombia’s rich native heritage, before the time of the Spanish occupation. 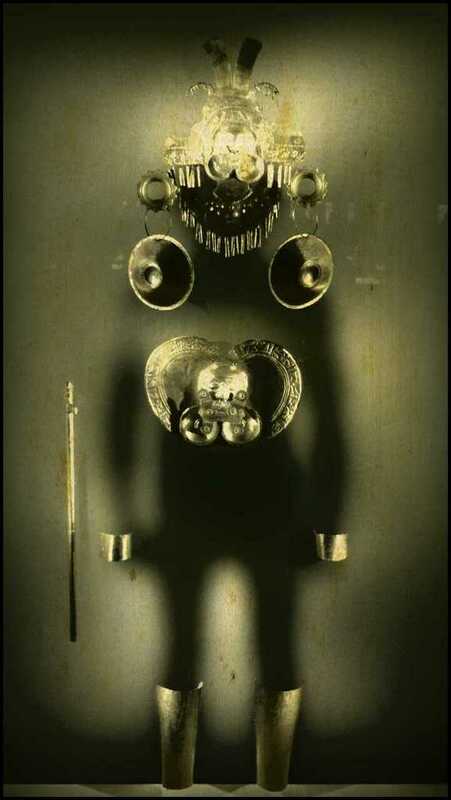 There are hundreds of exhibits and artifacts dating back hundreds to thousands of years. Maria and Ricardo took us to a great Italian restaurant which recently had a very cool and modern renovation. 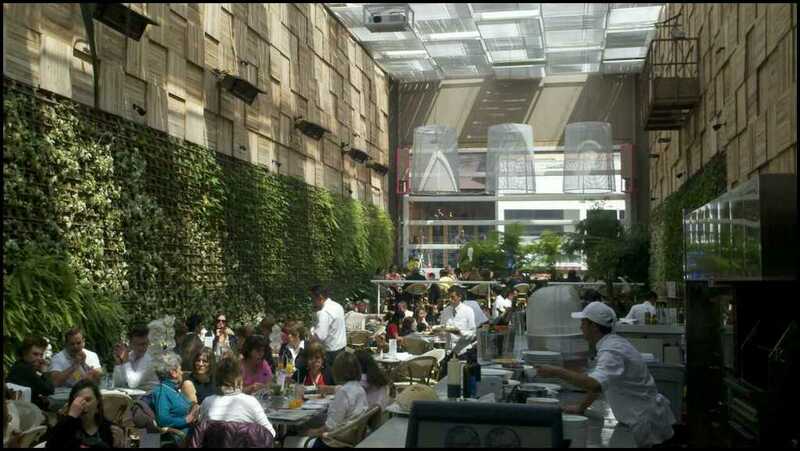 We found that many of the stores and restaurants in Colombia had this type of fashionable/designy feel. I love clean architectural design that makes use natural materials, plants, unique mixed texture, with a very minimalistic approach, so this was right up my alley. Very cool! 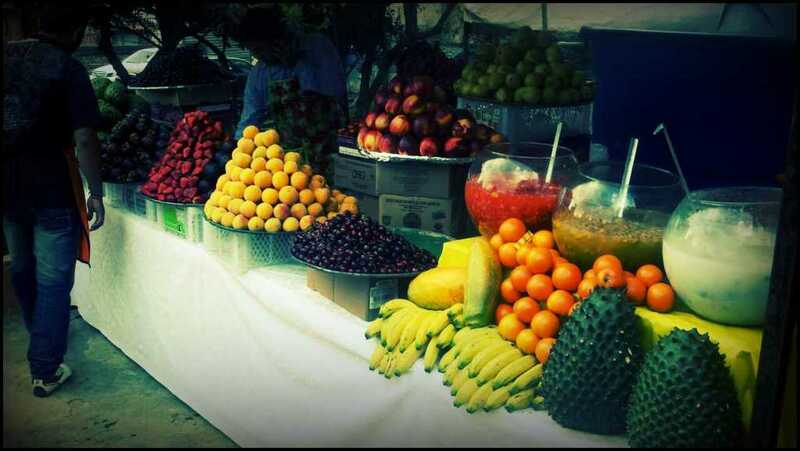 A flea market which had a lot of great native fruit, juices, local art, and all sorts of little trinkets. 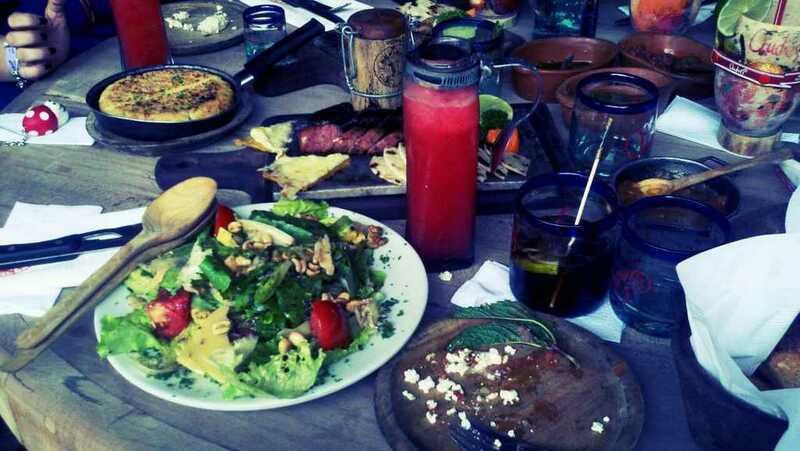 This entry was posted in Eats, Travels and tagged andres, andres carne de res, bogota, central america, colombia, colombian, eats, food, guadalupe, latin america, monsarrete, museo del oro, travel, travel diary, traveling, travels. Bookmark the permalink.